Weight: 81 tons (164,000 pounds)* — from earlier specs. May not be accurate. Cab Style: Dual Cab, aero cab on F-end, flat faced cab on R-end. 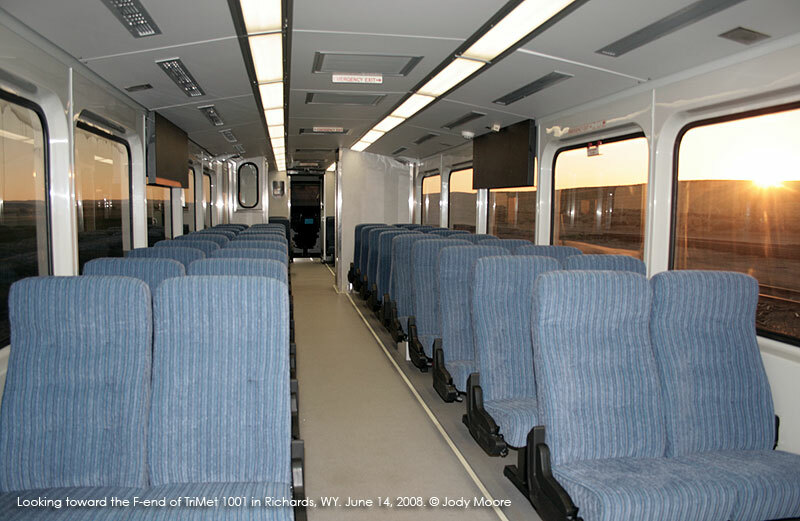 ADA Features: Wheelchair seating in passenger area. Ran as: CRMX 1001 (2008-present). Notes:In a relatively new market, Portland TriMet's initial four car order includes many firsts for Colorado Railcar's DMUs. Trailer car 2001 is the first unpowered cab car built by the company. The cars are also the first strictly high floor cars built, with no stairs for a low-floor platform (which TriMet doesn't have), and the first DMU's build without restrooms. 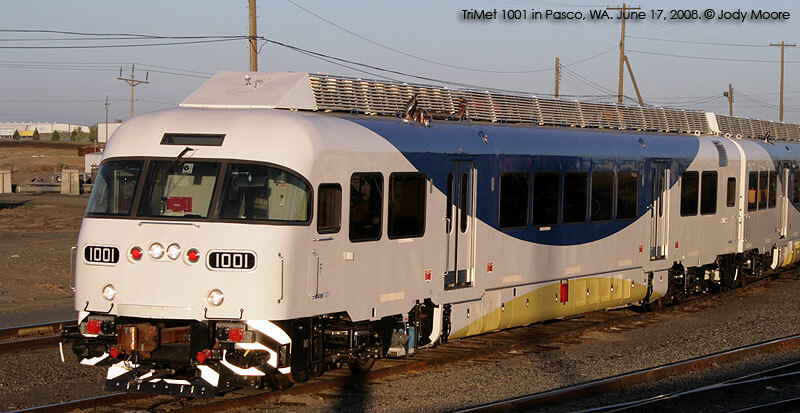 The TriMet DMUs and trailer feature a redesigned aero cab. The DMU has 74 seats, and includes two bike racks. 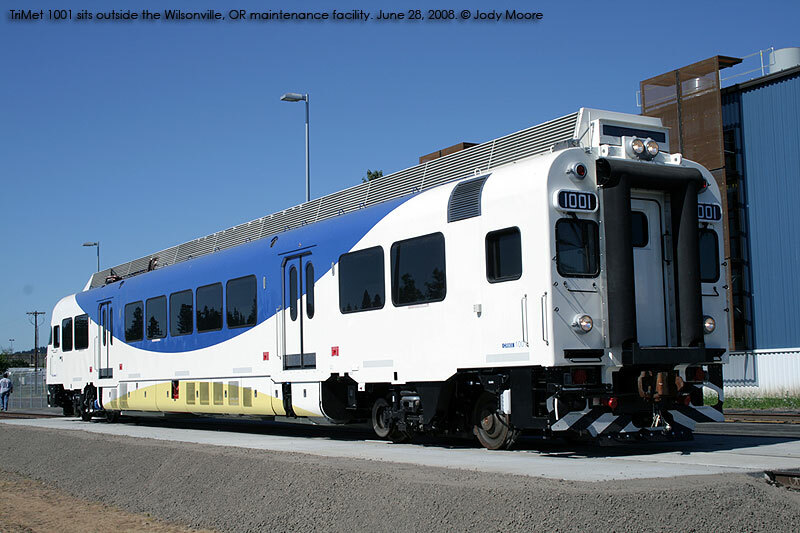 The cars are to run on a new commuter rail service between the western Portland, OR suburb of Beaverton to the southern Portland suburb of Wilsonville. The service is hoped to be the start of a larger regional service between Portland and Salem, OR, paralelling the Cascades service already run by Amtrak and the state DOT on a different line. The cars are expected to go into service in Fall 2008. 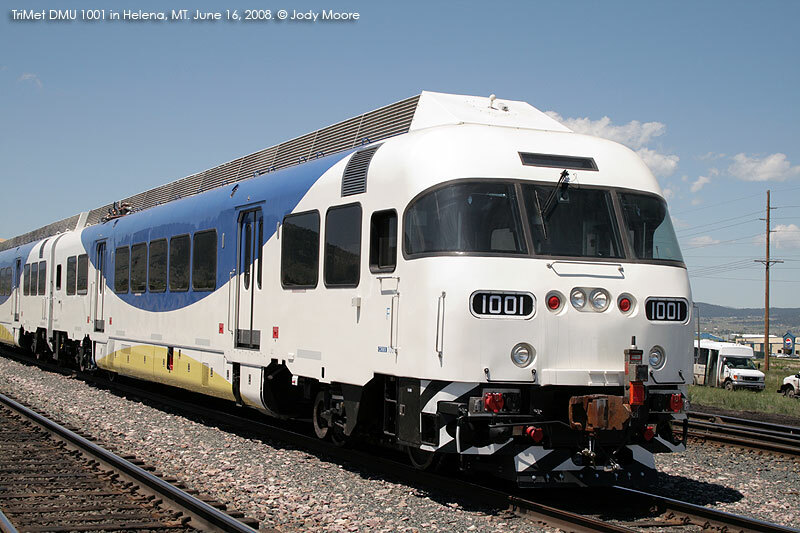 TriMet 1001 in Helena, MT. June 16, 2008. Photo by Jody Moore. Click to enlarge. TriMet 1001 inside the WES Wilsonville Maintenance Center. June 19, 2008. Photo by Jody Moore. Click to enlarge. 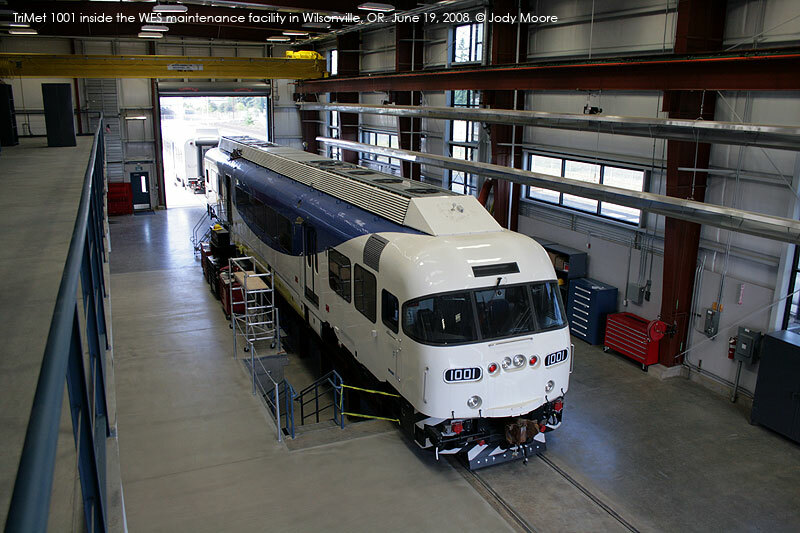 TriMet 1001 shows off its R-end cab at the Wilsonville, OR maintenance center. June 29, 2008. Photo by Jody Moore. Click to enlarge. 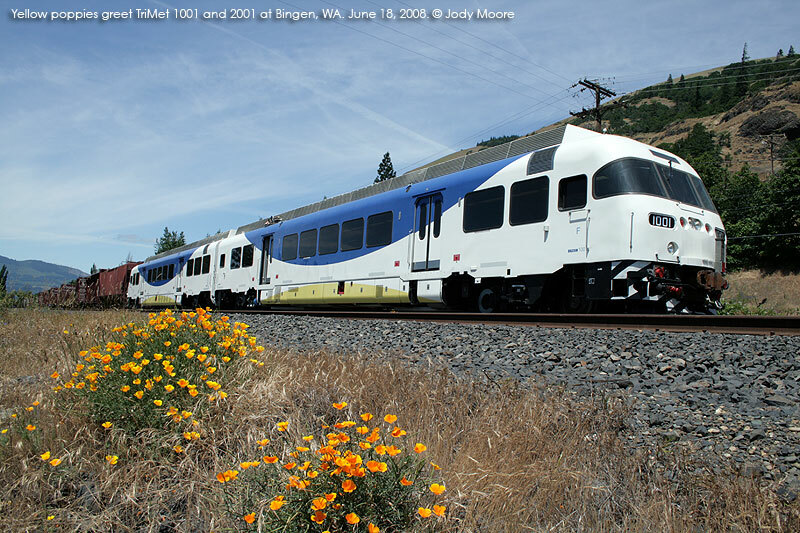 TriMet 1001 and 2001 pose with some wildflowers near Bingen, WA. June 18, 2008. Photo by Jody Moore. Click to enlarge. 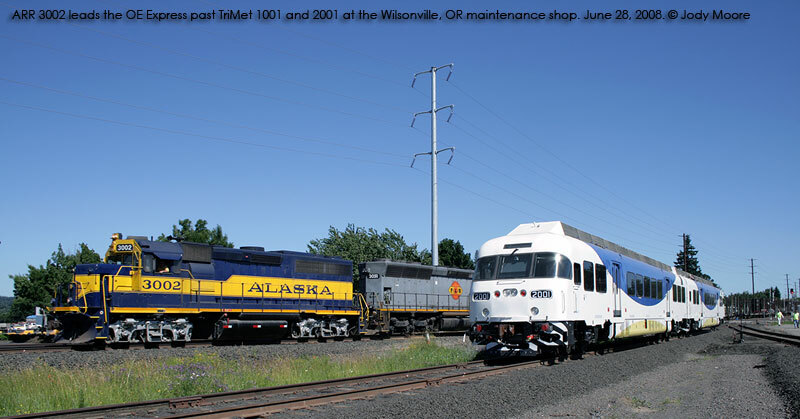 Alaska Railroad 3001 leads Portland and Western's OE Express past TriMet 2001 and 1001 in Wilsonville, OR. June 28, 2008. Photo by Jody Moore. Click to enlarge. Back to the Colorado Railcar DMU Rosters or click here to go back to the home page.